The rapid advancement of technology can make some people really nervous. What does the future hold for humanity with the development of robots, virtual reality, wearables and other innovative technologies? Technology can't take away our value system, unless we choose to ignore our guiding compass to make decisions and take action. The 20th of October is #WorldValuesDay and gives us an opportunity to stop and think what is important to us. Values are the things that are important to us and guide our choices, behaviours and influence our emotions. As we journey into the digital age, we need to decide which values are important to make healthy decisions that will benefit, and not harm, humanity. Robots will be part of our everyday lives, they already are, but which values will determine what robots can or can't do. Robots are already used in modern warfare. Sending a robot to a battlefield will feel very different to sending humans, but will our values change on what is acceptable warfare? What about virtual reality? This year, virtual reality headsets were introduced to the consumer market. As the market grows, we will more frequently experience life in a virtual world. Our value system will play a vital part in deciding what type of things are acceptable to do in a virtual world compared to the real world. We need to think about the development of AI (artificial intelligence) and how we respond to the way machines learn and make subjective decisions. It isn't a good idea to hand over our responsibilities as humans to machines! Parents play a really important role in teaching kids to hold on to good values and human ethics. 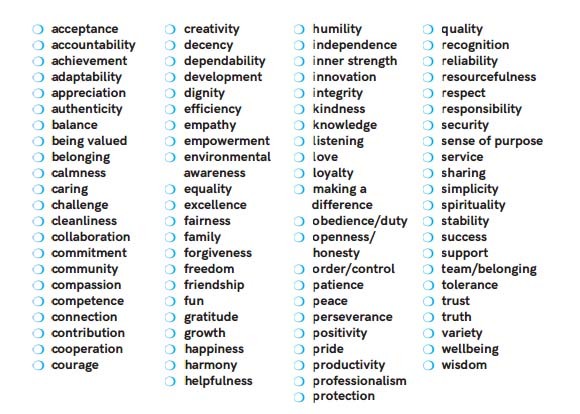 To celebrate World Values Day, pick 5 values that are the most important to you from the list of values below, and discuss them as a family. See my top values below. The following values are important to me as I teach my kids to be kind, considerate and participative members of society. Respect. Every person has value and we need to respect them, irrespective of our own opinions and experiences. Adaptability. Things are not going to stay the same, so learn how to fit into changed circumstances. Creativity. Nurture and develop creative skills, to find new solutions and innovate. Contribution. Working as a team and collaborating makes you feel part of the solution. Forgiveness. Recognise that sometimes you get it wrong. Let go of grudges to free yourself from being bound. What values are important to you? Choose it - Act on it - Share it - Pass it on!